My mom used to live in tops like this in the summer. Cotton knit, 3/4 sleeve, floral or stripes … And I totally get it. They’re so versatile, comfortable, and flattering. I miss my mom so much. And yeah, that lady was right about so many things! Mom had great style. Of course I don’t think she would’ve been rocking the ruffle hem jeans and heels in her 80’s, but you never know with mom. She for sure would be rocking this top and this tote bag! This pretty top is a new arrival at J.Jill! While you’re there, be sure to check out the sale they’re having right now: take an extra 40% off all sale merchandise! 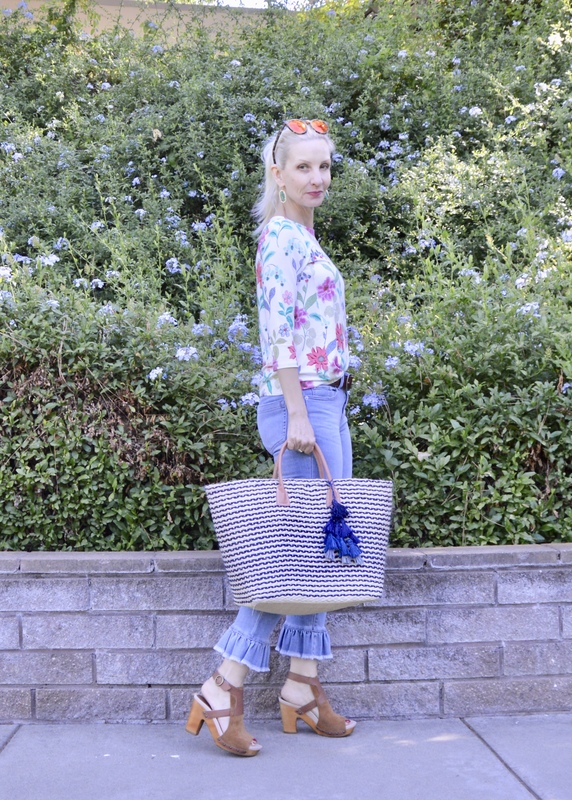 Loving this chic modern look from Anna of Looking Fabulous @ Fifty! Are you loving your July, Ladies? It’s sales season for sure … and I’m enjoying every minute of it! ICYMI be sure to check out what I bought at the Nordstrom sale and the most comfortable bra ever! Before you leave, link up your recent posts and share your sassy style with us! And have an amazing weekend! Those jeans are so sweet and you look cute as a button! Isn’t it nice when our moms are so fashionable? I definitely appreciate that my mom is still around although I might be able to twist her arm for the ruffle hem jeans. I mean heck, she’s wearing a ruffle hem skirt!! You look so stylish, I can’t decide what I like better–shoes, jeans, earrings, tote…! You look fabulous in this tiop and I adore the denim! Great jeans, love the shoes too! A very cool look! It’s so nice to have that connection to your dear mum followed through in your outfits. It’s a pretty, feminine top. 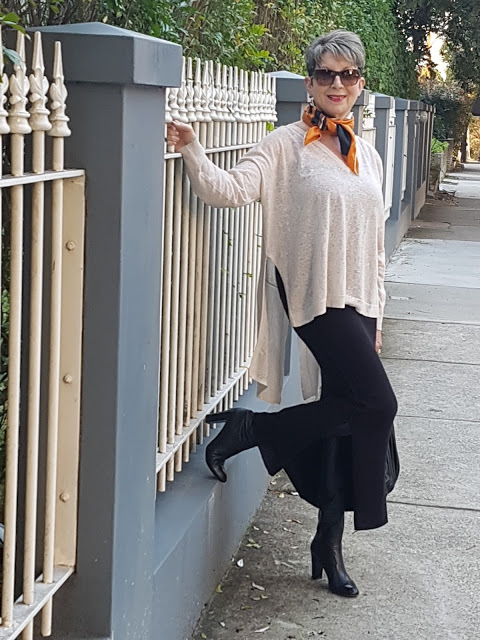 My mum wore mostly dresses, I think because she found they gave a sleeker line around the middle as it widened in her later years, avoiding a skirt and top meeting and bunching up and accentuating the area. Clever. X. Your jeans is perfect and your shoes are really eyecatchers too. 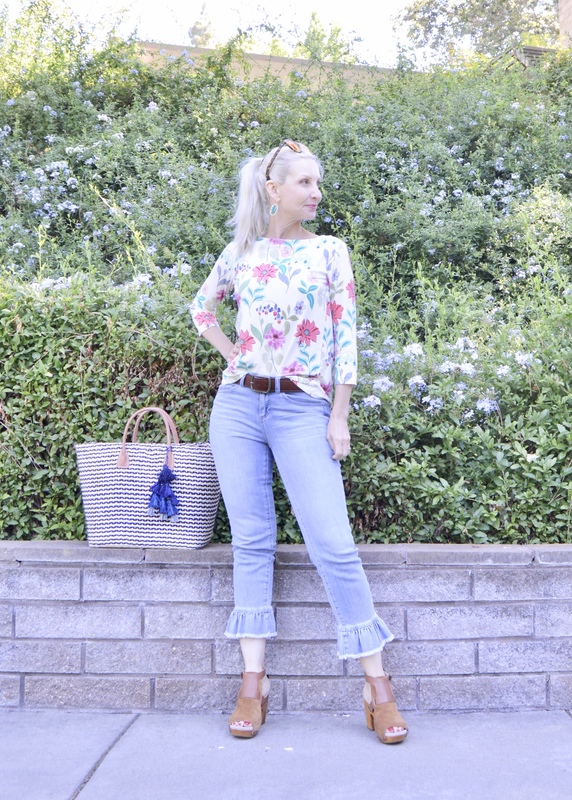 I love ruffle hem jeans!! Thanks for the linkup, have a lovely weekend gorgeous! You look fabulous!! Great jeans! What a cute look! I love those pants! Dawn, it is such a pretty top. I love these soft florals on you. And those ruffle hem jeans! Too cute! I love those jeans! I need to find a fun pair like that. Love the earrings they look great with the colors in your top. Such a pretty top, and I love those jeans! Hope you have a great weekend! Moms always know best—and I’m sure she’d love your pretty floral top! This look is stunning. The Tee is perfect for summer and your sandals are must-haves! So chic!